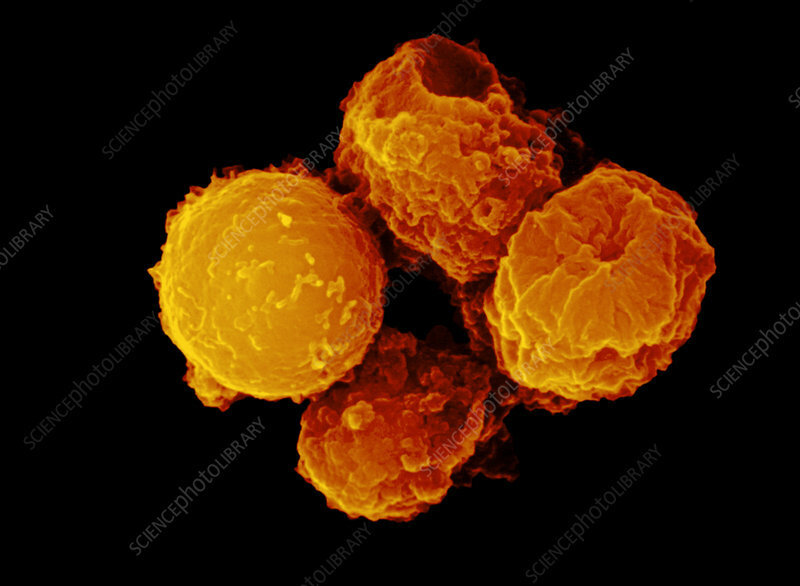 Color enhanced scanning electron micrograph (SEM) of apoptosis or "programmed cell death" (T- lymphocytes). Though recently due to disease, cell death is also a feature of many normal developmental processes, occurring when cells and tissues are needed only for a short period. Such programmed cell death (PCD) is genetically mediated. Human hands and feet, for example, begin as paddle-shaped structures, before skin cells between the lobes die on cue, leaving separate toes and fingers. The development of the nervous system likewise requires the programmed death of swarms of neurons, prior to completion of the fetal brain. Enhancement of af073b.